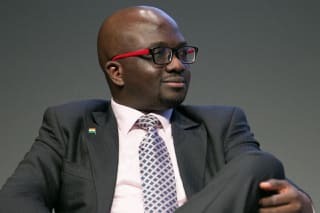 "Using digital technologies to catalyse development"
Ibrahima Guimba-Saïdou, CEO of Niger’s National Agency of Information Society, explains why the country is harnessing digital technologies to spur development. Salissou Hassane Latifa, crowned Miss Geek Africa 2018, launched a start-up after winning a competition to select Niger’s most promising ICT projects. Why is the country so determined to support ICT initiatives and entrepreneurs working in the sector? Niger is a land-locked country with a young population. We have no option but to make digital technologies a priority. We see those technologies as a way to catalyse development and grow what few resources we have. What’s more, people are the most important resource for any organisation or country. Two-thirds of Niger’s population are under the age of 25, so it’s vital that we combine digital technologies with the young, energetic, creative talent at our disposal. We have to create a supportive, entrepreneurial environment because our young people possess the creativity we need to ensure that development initiatives have a lasting impact. That’s why we are so focused on running programmes that foster talent and support youth. Salissou Hassane Latifa is a prime example of that. She was crowned Miss Geek Africa because she won the e-Takara competition in Niger. Initiatives like these are about unearthing talented people and giving them a chance to prove themselves on the global stage. Provided they get the right help and support, they will act as role models for other young people and, more importantly, create value for our country. How can digital technologies help tackle inequality, and empower women in Niger? One of the great things about digital technologies is that they don’t discriminate along gender, wealth or urban/rural lines. Our strategy is to use these technologies to bring people together throughout Niger. We’ve launched the ‘Niger 2.0’ programme, which maps out our path towards becoming an all-digital society, with a strong emphasis on tackling inequality. Other programmes include the flagship ‘Smart Villages’ project, which was launched by the Head of State to improve connectivity in remote communities. The overwhelming majority of Nigeriens live in rural areas. The project is about bringing people closer together and narrowing the inequality gap between urban and rural areas. Moreover, many women are engaged in income-generating activities in rural parts of the country. Digital technologies will allow them to raise the profile of their businesses as well as gain new skills. That, in turn, will help to reduce both gender and socio-economic inequality. You mentioned the Smart Villages project. What does it involve and how will local communities benefit? We want to bridge the digital divide and bring connectivity to village communities in Niger, which means installing communication lines to reach every village in the country. But those new lines will do more than allow people to make phone calls; the technology will be used to tackle key development issues. But before we can connect people, we have to make sure they have an energy supply – at least in public spaces. Under the Smart Villages project – which aims to develop a digital platform – we plan to scale up tele-medicine services so that people living in rural areas can speak to a doctor remotely. This new initiative will help us treat patients earlier. There also aren’t enough teachers in our villages. We plan to use digital technologies to roll out distance learning, build rural teachers’ capacities, and introduce technical and vocational training in villages. In addition, we aim to provide rural crop and livestock farmers with a range of tools, solutions and services. The ‘Smart Villages’ digital platform will also give farmers access to real-time information about weather conditions, market prices, buying centres and other relevant details. We also plan to set up a system so they can easily access government services. Having a connection means that rural communities no longer have to travel to access services. That, in turn, saves a considerable amount of time, leaves citizens feeling more involved in development initiatives, and allows the government to deliver high-quality services. The project is also about facilitating and promoting e-commerce. Currently, village communities are struggling to offload agricultural produce and handicrafts because they can only sell their wares at weekly markets. Selling three or four pairs of shoes every week isn’t going to help people lift themselves out of poverty. The digital platform will therefore also allow people from different villages to sell to customers remotely, and the products will be delivered by post or courier service. That way, producers will be able to sell to a much bigger base of potential customers, and improve the quality of their produce. Producers can also take payments via mobile money or bank card. The digital platform will also make life easier for public officials stationed in rural areas – not least because of a new policy, launched by the government in late 2018, that all civil servants should have bank accounts. Currently, officials have to travel to the bank in a nearby town or city to draw out their wages. The plan, instead, is to pay officials’ wages into an e-wallet that they can manage from the village where they’re stationed. That would be a major step forward because, at the moment, civil servants are often away for up to a week or 10 days just to draw out their wages. In the education sector, for instance, this situation deprives pupils of 2 or 3 months of lessons every year. What big challenges does Niger face in terms of scaling up digital technologies for agricultural development in rural areas? The biggest challenge is geography. Niger is a vast country with a relatively thinly-spread population. A lack of roads means some parts of the country are hard to reach, and getting services to people costs a lot more here than it does elsewhere. The low literacy rate is another problem, but that could well be solved once we’ve rolled out digital technology. The third and final challenge has to do with access to energy. Rural communities have no electricity supply. Across Niger, the rural electrification rate is 1%. Those are the three big challenges we face, but they’re not insurmountable. The Trans-Saharan Fibre Optic Backbone project aims to improve connectivity between Niger, Chad, Algeria and Nigeria. How can the agricultural value chain benefit from this initiative? Once complete, the project will help to improve connectivity within Niger and open up better channels of communication for rural producers with these other countries. That, in turn, will raise the profile of Nigerien produce and put our farmers in direct contact with potential customers. At the moment, some of their produce doesn’t reach those countries because they don’t know who they can sell to. To sum up, the project will connect all parts of our agricultural value chain with potentially huge markets in neighbouring countries, and with other markets elsewhere in the world. Zambia Country Director for the World Wide Fund for Nature (WWF), Nachilala Nkombo, discusses the role of both the public and private sectors in adapting agricultural value chains in response to the dual challenges of rapid population growth, and climate change. Faith Milkah Muniale discusses her involvement in the African Women in Agricultural Research and Development (AWARD) Fellowship, and her work with indigenous Kenyan communities. Dr Wanjiru Kamau-Rutenberg, director of African Women in Agricultural Research and Development (AWARD), discusses the importance of gender responsiveness and building women’s confidence across the agricultural sector.